Following the Lambeth Show I’ve been thinking a lot about publicly displaying photos and models of unborn babies. Lambeth Council have made it very clear that they did not like or approve of this part of our stall. You would think, from the language the Council and the papers have used, that we were showing graphic images of babies post-abortion or that our stall was loudly and intrusively condemning abortion. But it wasn’t. We were there to celebrate the amazing way in which we all grew inside our mothers’ wombs in a family friendly, fun and educational way. The other weekend in Brighton, I walked past a group of protestors wearing white masks and holding up laptops. Curious, I walked closer to see what was on their screens. It was video footage of, what I would consider, inhumane treatment and slaughter of animals. Seeing my interest, one of their unmasked volunteers approached me and started up a conversation about whether I ate meat or considered the impact of eating meat. I told him it was something I had given a fair amount of thought to and I was still mulling over. As I was delaying those I was with, I agreed to take the card he offered me and went to catch up with my friends. A successful protest; a pebble was dropped in my shoe. That Sunday I was just planning on pottering around sunny Brighton. I was certainly not planning on having my lifestyle challenged. I’ve been an animal lover all my life and the video I saw was unpleasant and distressing. But many things in life challenge us, often unexpectedly, and that’s a good thing. Those protestors had every right to be there. Just walked passed and ignored the protest. Watched the video and concluded that I’m ok with what I saw and decide to carry on eating meat- lifestyle unchallenged. Watched the video and considered the issue more. Perhaps I might alter where I purchase meat from or whether I eat meat at all. My response to their protest is entirely up to me. Furthermore, I respect these volunteers for giving up their weekend to show to the world something they believe society should challenge and set right. So how does this compare with what we were doing at Lambeth? I don’t think it is a fair comparison at all. I think a fair comparison with the issue of abortion would be the protests of a group such as Abort 67. Just like these animal rights protesters, Abort 67 takes to the streets offering peaceful protests, leafleting and revealing images of abortion victims. They often have warning signs explaining the area is displaying graphic and challenging content. Whether you support the use of graphic imagery in either context is neither here nor there for the purpose of this blog. Both seek to unveil a hidden victim; both show a truth that is upsetting to stumble across. 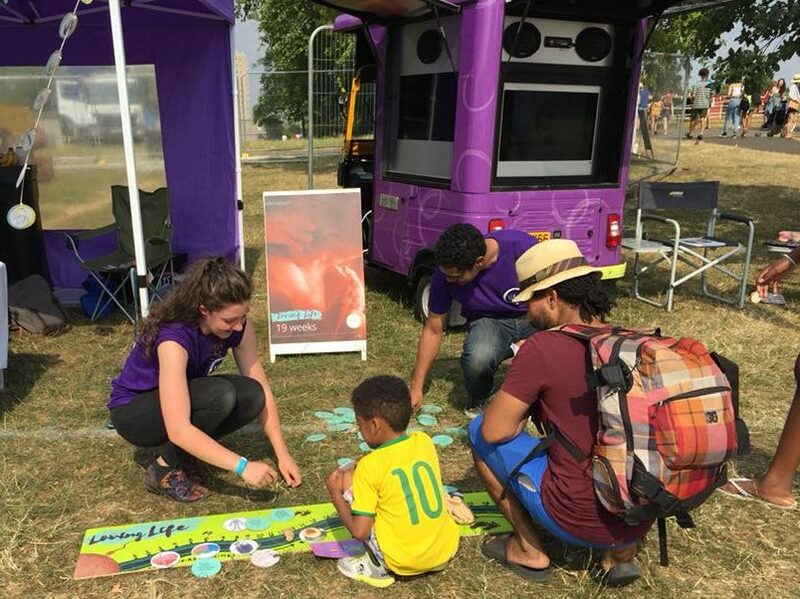 So what is a fair comparison to the #LovingLife roadshow stall that we had at Lambeth? This is the leaflet we offer to people coming by our stall if they look interested. It’s the development of how each and every human grows and develops inside the womb. 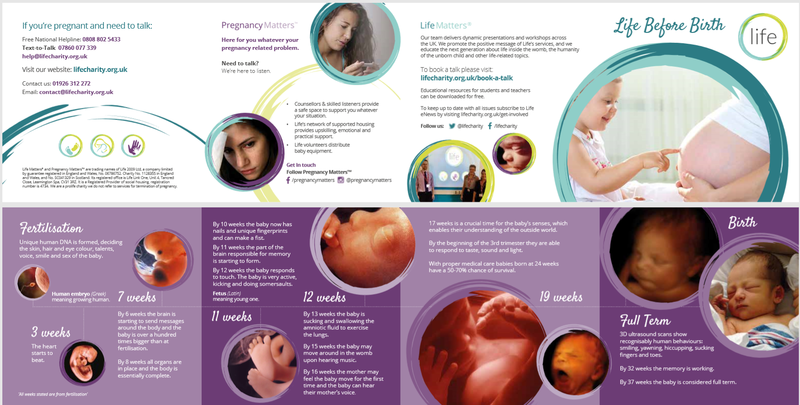 You’ll notice the leaflet does not have the word abortion in it. We’re there to celebrate life and pregnancy and to offer support. Imagine an inner-city stall popping up with the purpose of sharing what rural farm life is like. The stall shows different animals that are kept on the farm, how they care for them and the different breeds of sheep, cattle, hens and pigs. They would probably have photos to show these different breeds and maybe a toy farm yard for the children to tangibly see areas for grazing, for milking, the coop for the hens and so on. The stall has games too: you can guess various animals’ hooves, fur or feathers and the noises they make. A charity that does this may well be passionate about animal rights, about treating the animals well, perhaps encouraging people to reduce the demand for cheaply and immorally sourced meat. But today, their stall is nothing but educational games. As a meat eater walking past the stall, to demand the photos of cows, the games and information about the lives of these animals to be hidden because we live in a society where meat is regularly eaten, is utterly ridiculous. Perhaps when you walk past, it does makes you think about our culture eating meat. Perhaps you reflect that you love a McDonalds and regularly treat yourself to a Big Mac for ease. You can consider the issue more. Once again, perhaps you might alter where you purchase meat from or whether you eat meat at all. What you can’t do is demand this educational stall doesn’t exist because it is an uncomfortable reminder that tasty bacon comes from pigs. I think in this imaginary farm stall we have a fair comparison. So, when walking past our LovingLife stall, perhaps it makes you think about our culture approving abortions, or that yourself or someone you know might have had an abortion. You can walk past and not engage. You can approach the stall and look at the images or the leaflet and leave deciding that abortion is morally acceptable. Or you can leave the stall, like I did at the protest in Brighton, with a pebble dropped in your shoe, taking a leaflet and promising yourself to think about it more. If our culture cannot bear to look at the very beginnings of human life because it is too upsetting, we must ask ourselves why. To hide the images rather than to seek the answer to this question is to adamantly pull the wool over your own eyes and the eyes of others and blindly plough ever onward. Hi! Love the blog post keep up the good work! Great blog post, thoughtful and thought-provoking. An honest and accurate comparison to make in terms of who has a right to say what to whom. Lambeth Council are among those who are fearful to face a simple truth and so they pretend it's something else and convince themselves of this. When the truth is revealed, they get angry and act in haste which usually means in an unjust way. I feel for their unhappiness. Excellent blog. All human life should be valued and nurtured from conception through to birth, life and on to natural death. Keep up the good work Clare and others! As a vegan prolifer I love this post and that a pebble has been dropped in your shoe re animals, so I do hope you will go vegan Clare and live according to your own ethics about animal cruelty! There is lots of support available and you may like to read Kristin Monahan's article comparing the ethos of veganism and prolife, very similar in many ways! Feel free to get in touch and there are lots of us vegan prolifers around who will make you feel welcome in the vegan community on your journey to extending your compassion for life! A very interesting and balanced account. Unfortunately when it comes to the abortion debate, dissenters invariably demonstrate a hair trigger response in order to shut down the debate. Those who say they believe in free speech and open discussion are often provoked into state of hostility at the very mention of the A word. The response of the Lambeth Council to a stall which can only be described as educational, was excessive in the extreme. Is there an inconvenient truth here ? An excellent blog. Keep up the good work. There are none so blind as those who don't want to see! I don't think Lambeth Council is noted for its tolerance of opposing views. Great article - may I make an interesting observation though? I for one agree very much with your comparison of the LoveLife stall to an informative animal stall - however people who defend abortion will mostly not agree with you at all and say that it's different. Why is that? Because even those with seemingly low moral standards can recognize that killing a human being for our own personal benefit is much worse than killing an animal, and that we are all to some extend complicit in the slaughter of abortion, therefore even looking at developing human beings in the womb is unbearable! Shrinking back would be easy, but we cannot afford to do so! interesting read. I'm another pro life vegan. I gave up meat after visiting an agricultural college and learning about the state of the pigs. I too started by sourcing my meat. free range meat is more expensive then tinned fish and I didn't know about the cruelty or harm to marine wildlife that is involved in fishing so I became Pescatarian(A fish eating vegetarian). Now I've been vegan for about 14 years and it feels great.